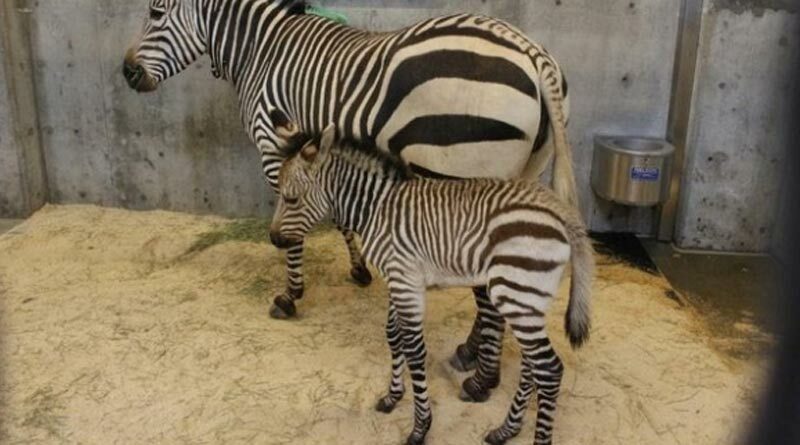 A rare Hartmann’s Mountain Zebra foal is only the second of her species to be born at Utah’s Hogle Zoo in the US. Born on June 2, the as-yet unnamed filly weighed 74 pounds at birth. She made her first public appearance at the Salt Lake City zoo with her mum, Ziva, at five days old. The first Hartmann’s Mountain Zebra foal born at Hogle was Poppy, who was born to Zoey in April 2017. Like the new foal, Poppy was also sired by Ziggy. The zoo now has five Hartmann’s Mountain Zebras. Hartmann’s mountain zebras are a subspecies of the mountain zebra, which is one of three zebra species. Considered vulnerable by the International Union for Conservation of Nature, Hartmann’s mountain zebras live in dry mountain habitats of Namibia. Unlike other zebra species, Hartmann’s mountain zebras live in small herds, have vertical stripes on their neck and torso and horizontal stripes on their backside, and have a small fold of skin under their chin (called a dewlap). With fewer than 9000 individuals left in the wild, the Hartmann’s mountain zebra faces threats from hunting and habitat loss. It is beautiful and fitting tribute. Thanks to all who made it possible.